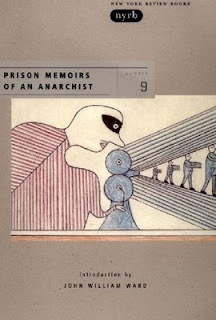 A review of Alexander Berkman's Prison memoirs of an anarchist by the Infantile Disorder blog. "Oh, if labor would realize the significance of my deed, if the worker would understand my aims and motives, he could be roused to strong protest, perhaps to active demand. Ah, yes! But when, when will the dullard realize things? When will he open his eyes? Blind to his own slavery and degradation, can I expect him to perceive the wrong suffered by others? And who is to enlighten him? No one conceives the truth as deeply and clearly as we Anarchists." Yes, Alexander Berkman really was that annoying and up his own arse when he was sentenced to twenty-two years (though he got eight years off) for the attempted assassination (or 'attentat') of Carnegie Steel boss Henry Frick. Prison Memoirs is therefore the story of an arrogant, delusional elitist 'anarchist' from a bourgeois background becoming someone halfway decent, with respect and genuine fellow feeling for working class people. Wow, prison works! Berkman left Russia for the United States at seventeen, and became radicalised - like many others of his generation - by the events surrounding the Haymarket bombing. He started working with Emma Goldman (with whom he would have a lifelong relationship) and Johann Most, a staunch advocate of 'propaganda by the deed' - ie. political assasination as a supposed catalyst for anarchist revolution. When Frick tried to break the Homestead Strike in Pittsburgh, and the violence of his hired Pinkerton 'security guards' left many dead, Berkman decided to kill Frick. However, his attempt was unsuccessful on just about every level, with Frick surviving, Berkman ending up in prison, and the working class turning its back on him in disgust. "Now, I do not believe that this deed was terroristic; and I doubt whether it was educational, because the social necessity for its performance was not manifest. That you may not misunderstand, I repeat: as an expression of personal revolt it was inevitable, and in itself an indictment of existing conditions. But the background of social necessity was lacking, and therefore the value of the act was to a great extent nullified." He had learned - much too late for his own freedom - that political assasinations can only have a negative impact on revolutionary 'movements' in the absence of widespread class consciousness. Working people would only have their preconceptions of revolutionaries and ruling class figures intensified by the act. ription, the Bolshevik counter-revolution in Russia, and many magazine articles, books and pamphlets - until the eve of the Spanish Revolution, when he committed suicide to escape the pain of a prostate condition. Prison Memoirs is a fascinating insight into prison life, his relationship with Emma Goldman, and the slow evolution of his personality, from complete wanker to alright guy.